CiCi’s Pizza franchise business opportunity. Free CiCi’s Pizza business franchise information. The explosive growth of the red-hot CiCi's Pizza Buffet concept has been fueled by its commitment to serving high quality food at phenomenally low prices. CiCi's offers 16 kinds of fresh, hot, delicious pizza, pasta, salad and desserts in a $3.99* all-you-can-eat buffet format. Kids three and under eat for FREE! CiCi's is a safe, clean, family environment offering fresh tastes at a great price. You'll find us serving hungry, pizza-loving folks in suburban areas of large metropolitan cities, as well as in small to medium-sized towns. We seek high exposure, 4000 square foot locations in high visibility shopping centers or freestanding buildings. 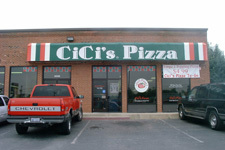 Over 90% of CiCi's Pizza restaurants are franchised. We welcome both single franchise and multi-unit owners who have a passion for quality and service. CiCi's Corporate Marketing Team develops and administers advertising and sales promotion programs designed to promote and enhance the collective success of all restaurants in the CiCi system. In our current program, we work with the franchise system to build restaurant sales through strategically sound, detailed Local Market (DMA) Media Plans and the creation of impactful advertising vehicles (Television & Radio Commercials, 4/color Print) that effectively build awareness and trial through communication of the CiCi's brand message. Additionally, CiCi's Marketing creates and distributes cost-effective Local Store Marketing programs that can be customized by restaurant location. All stores contribute monthly to the advertising fund. If you wish, we will refer you to an approved broker. You are not required to use this broker but if you do, the broker will analyze your market and identify sites that meet CiCi's strict standards. They will also review any site(s) that you might have in mind. Each site is submitted for approval and a CiCi Enterprises, LP representative will personally visit the site. After CiCi's approves the site that you have selected, we can suggest an attorney for lease negotiation, or you may select your own attorney. If you use your own attorney, CiCi Enterprises, LP will require an attorney of our choice to review the lease to ensure that all provisions provided for in the Franchise Agreement for CiCi Enterprises, LP rights' as franchisor are included in the lease. JMC Restaurant Distribution, LP is the approved supplier for virtually all of the food, equipment and supplies used in the restaurant. Serving the entire restaurant system from three strategically placed distribution centers located in Coppell (Dallas), <?xml:namespace prefix = st1 ns = "urn:schemas-microsoft-com:office:smarttags" />Texas, Atlanta, Georgia, and Richmond, Indiana, JMC is focused solely on the needs of CiCi's Pizza. Whether it be supplying the equipment package for a new restaurant, or delivering high quality, CiCi's specified products every week, JMC is dedicated to providing THE BEST quality, service and price to each restaurant. As the CiCi's systems continues to grow, JMC uses these economies of scale to obtain lower bulk pricing and pass these savings along to the restaurants. JMC's single-minded focus on serving CiCi's allows the managers and Franchisees to concentrate on serving their guests without the worries that are often associated with the supply chain. To learn more about the CiCi’s Pizza franchise opportunity, simply complete the form below.